Hearing devices technology has now become an integral part of our lifestyle and is a great help for the ones battling the war with hearing loss. Just like wearing glasses, hearing aid devices are no reason for embarrassment anymore. Modern hearing devices are stylish, discreet, and are totally acceptable in modern society. Whilst we provide you with the latest technology in this section, we would like to stress, yet once again, on managing your hearing loss and move on to discuss what's available in the world of hearing aid devices technology. What the modern hearing devices offer? The biggest accomplishment that this technology has achieved in last 15 years is the size and discreteness the modern hearing aid devices are now decked with. Gone are the days when you had to carry a receiver in your pocket that was connected to the earphone in your hear. Today's hearing devices are targeted to achieve the technology of tomorrow. It is amazing to know how much technology these hearing devices can offer, irrespective of their tiny appearance. One of the achievements of mankind is the conversion of waves from analogue to digital. This allows the sound waves to be manipulated into digital output that can be harnessed and calibrated. 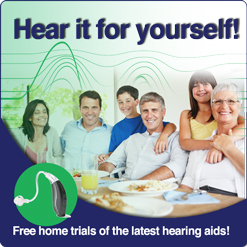 The same technology in hearing aid devices makes wonders in the life of hearing loss sufferers. 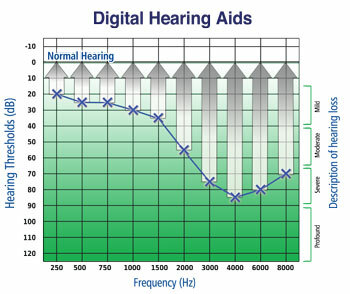 Sound entering through digital hearing devices is broken down in different frequencies to be calibrated and modified to an individual's comfort and preferences. Compared to analogue frequency, that offered 2 wave bands; this new technology now offers 24 wave bands that can each be controlled and adjusted to achieve optimum outcomes for the hearing loss sufferers. These modern hearing aid devices have truly proved to be a great boon. Feedback cancellation in terms of hearing aid devices stands for the unwanted sound getting processed and amplified as a normal sound by hearing devices. This sound is generally addressed to as whistling or squealing and is often annoying and embarrassing. The new technology now detects and cancels out these frequencies within a split second to avoid these situations. This technology is the classic case where introduction of one technology opens the door for another. Feedback cancellation allowed the hearing aid devices to be more agile in opening up the ear passage. Previous technology blocked out all the other environmental noises and allowed it to process only through the receivers. That created echoing as if talking in a barrel or listening to your own self. A thin tube from the shell that sits behind the ear is passed through to the ear canal. This leaves most of the passage still open for ventilation and does not cancel out the other environmental sounds and provides a new level of comfort for the people with hearing loss issues. Yes! That's exactly what it is. It is so small that it fits inside the ear canal, making it completely invisible and discrete to be seen from outside. No one can even notice that they are there. These type of hearing devices are used in Deep-Canal treatment. This feature now offered in many of the hearing aid devices is designed to automatically manage sound levels for situations when some particular sound is needed and the others need to be suppressed. For example, in a crowded environment you would rather pay attention to the person you are speaking to and cancel the others talking around you. Old technology used to amplify all kinds of sounds, whereas, this new technology suppresses to a point that it still can be heard in a non-disturbing fashion. It does that by controlling the 24 frequencies in variable environments. Now that's amazing for hearing devices to sense the type of environment you are in and automatically adjust itself. Discovery of this technology has taken the hearing aid devices a level higher. 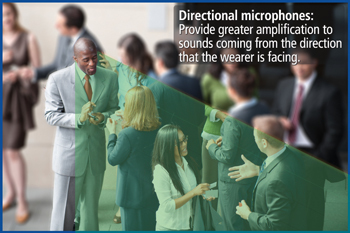 Directional Microphone technology works on the similar grounds as noise management, only a step advance. We call it a step advance in the sense that it has two tiny microphone inside, which focus on the sound coming from front and the sound coming from back or the sides. It then programs the sound to focus on the front, giving more clarity in a crowded place like bus stops, markets, parties, etc. This allows the wearer to follow conversations in any busy environment. Such hearing aid devices address individual needs and offer the right solution. Inter-connectable devices are not available to fill the gap between hearing aid devices and the other electronic devices like phones, mobiles, TV, radios, and portable sound generating gadgets. This cuts off the background noise without the need of processing signals within the hearing devices. We at Global Hearing work according to pro-technology and believe in capitalizing the benefits. If you have heard of any technology and want to try some of the modern hearing aid devices, please give us a ring on 03 9852 4440 or click here for a consultation.